BOLT-ON UP TO 300+ HP WITH PROCHARGER INTERCOOLED SYSTEMS AND TUNER KITS! Building on more than 20 years of forced induction engineering and innovation, ProCharger is the first centrifugal supercharger manufacturer to design and release a supercharger system for 2017-15 Mustang GT's. With an original billet aluminum bracket design and compact belt-drive system, ProCharger systems and tuner kits, with highly effective air-to-air intercooling, continue to lead the industry in OEM-style fit and finish, ease of installation, and reliable performance. ProCharger Systems are supplied with proven tuning calibrations and a handheld programmer set for a 65-70%+ HP (Stage II Intercooled System, 10 psi) or 55-60%+ HP (HO Intercooled System, 8 psi) power gain over stock, running pump gas. Featuring the most advanced and durable superchargers, with the industry's coolest charge air temperatures, much higher power levels are possible with higher boost and custom tuning. 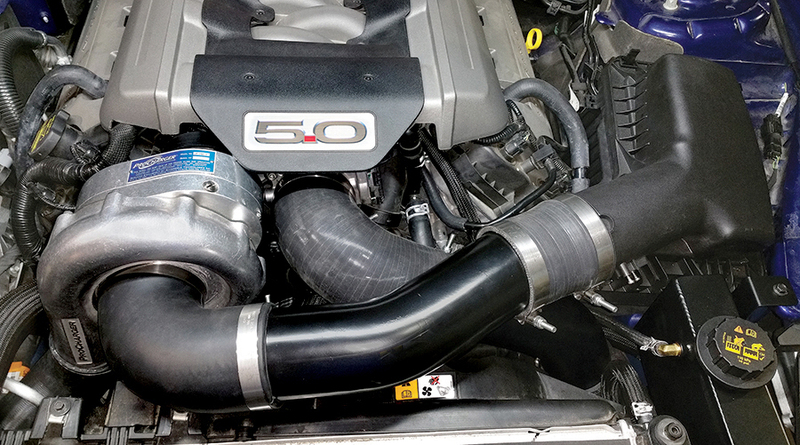 Installation of this system is the easiest of any Mustang supercharger system to date–a customer can install this system in his/her garage with common hand tools in a day. For the collector/lease-owner in mind, the HO system is 100% reversible, with no trimming or cutting to any factory OEM plastics or hardware. As if that wasn't enough, you also have your choice of multiple supercharger and bracket finishes: satin, polished, or our new black finish. ProCharger's 2017-15 Mustang GT HO Intercooled Systems with are supplied with proven tuning calibrations and a handheld programmer set for a 55-60%+ power gain over stock, on 8 psi of boost and pump gas. Higher boost levels and horsepower gains of up to 70%+ are possible with an Intercooled Tuner Kit and custom tuning, and even higher with modified motors. For modified motors, or racing applications ProCharger offers a Stage 2 system, with dedicated drive system, larger air-to-air intercooler, and a vast range of supercharger head units from the to F-1R (1,200+ HP Capable). The HO and Stage 2 ProCharger systems also give Mustang owners multiple options in both the performance and appearance arenas, with your choice of polished, satin, or black finish for both the brackets and head unit. As well as multiple intercooler sizes to best fit the HP level of the customer. Installation is the easiest of any Mustang supercharger system to date, and a customer can install this system in his/her garage with common hand tools, in a day. And for the collector/leased owner in mind, both systems are 100% reversible, with no trimming or cutting to any factory O.E.M plastics or hardware. Click the button below to add the PROCHARGER to your wish list.